Location: In the Southern Andes at an altitude of 2,350 meters or7,600 ft above sea level. Climate: Sunny and dry. It’s cold at night and the rain period is from January to March, there is sun nearly all year around. The temperature goes from 24°C (75°F) in the morning to 10°C (50°F) at night. 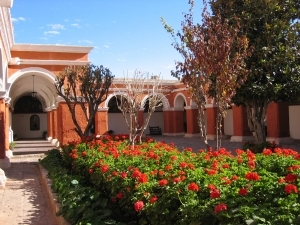 Arequipa is Peru’s second largest city .The department of Arequipa contains more than one million inhabitants. It geography is composed of a series of desert plateaus at different altitudes located at the foot of the Western Maritime Cordillera of the Southern Andes. The Incas highly respected these volcanoes since the melt water from their snow-capped peaks form the headwaters of the mighty Amazon River, thousands of kilometers away. 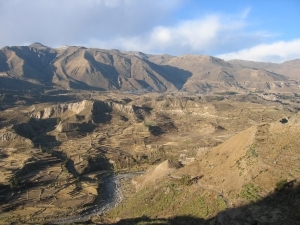 Arequipa is also connected to Lima and Tacna by the Pan-American South highway, which is in excellent condition. The traveller can reach Puno on a paved highway. Buses to Arequipa by the southern Pan Americana highway from Lima (1030km, approx. 18 hours), from Nasca (570km, approx. 10 hours), from Puno (325km, approx 8 hours), from Cusco (625km, approx. 12 hours) all by paved road! From Arequipa to the Colca Canyon takes 3 to 4 hours by half gravel and half paved road in a hired transportation. Trains from Juliaca to Arequipa (10 hours).,for the moment only cargo ! This region is known because its volcanoes, the most famous one are the Misti (5,822 m. nevertheless, the city is surrounded by magical countryside giving it a refreshing, bucolic air. 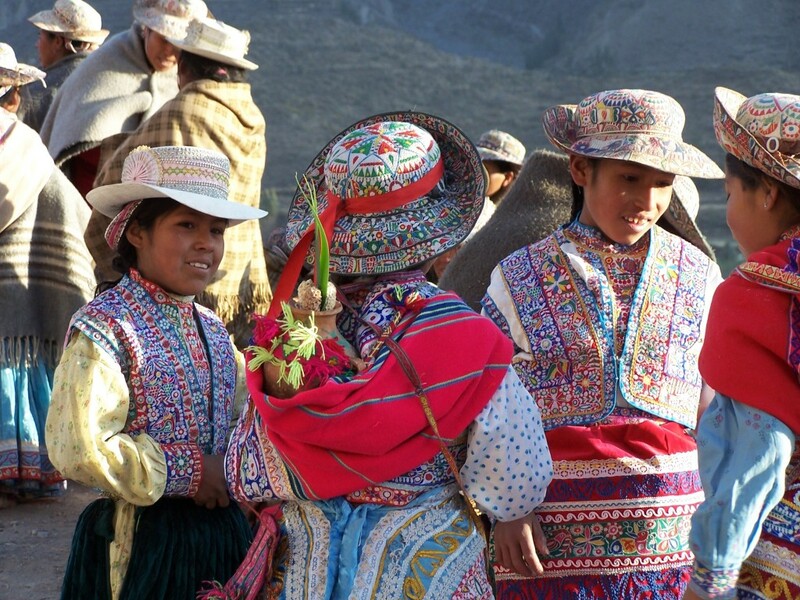 The most interesting place to visit with gorgeous sceneries is the Colca Canyon, the 2nd deepest canyon in the world. There you can appreciate beautiful Andean landscapes like fields with terraces, snow capped mountains and the canyon itself as a giant deep scar in the ground. Also, don’t miss the flight of the condors, the king of the Andean skies. For more info, look at our individual program. The spectacular Valley of the Volcanoes in Andagua, the beaches of Mollendo and Camana and Puerto Inca beach in Caraveli, are all fascinating places which must also be visited. The city’s name comes from the Quechua phrase “Arequipai” which means “Yes, stay”.The city of Arequipa was founded by the Spaniard Captain Garci Manuel de Carbajal on August 15th, 1540. It became in an important and wealthy town because it was a mandatory stop for the silver from the mines of Potosi (in Bolivia) in its way to Spain. Also, it was the center of the commerce and trade between Lima (capital) and the Southern territories. All these made of it a wealthy community, that’s why many churches and mansions were built in this town, all made with “sillar” (white volcanic rock) whose porous composition makes it easy to carve and work with). Arequipa was totally destructed in 1600 by a heavy earthquake and volcanic eruption. The anniversary of the foundation of Arequipa city is in August 15th, and it are many festivities the whole month, it’s also a great opportunity to try the local cuisine, famous because its spicy flavors, also considered the best of Peru. 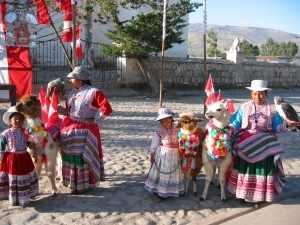 Also in the countryside are many local feasts the whole year, especially in the Colca Valley. Most of them are catholic feasts, but their are also big festivities with fireworks, bull fights, people wearing typical clothes and of course music and dance. One of these feasts is carnival in February. You can do some hiking and camping in the Colca canyon, the 2nd deepest in the world after Cotahuasi Canyon (also in Arequipa State). There you can go to the bottom of the canyon (1,000 mts or 3,300 ft. depth) where the Colca River flows and camp beside it. The climb to the top of the canyon is hard, but it is worthwhile because its sceneries. You can also do rafting in the Colca river or Chili river after the rainy season, March and April is the best time to do it. It is very rough in some parts, so you must do it with professionals, who have been there before and know the river and rapids. 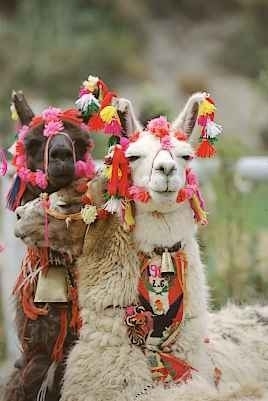 For the more adventurous they can climb the volcanoes or go for a mountain bike ride! 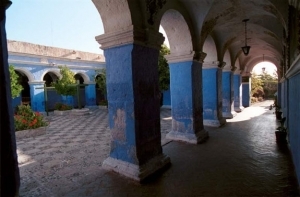 With an area of 20,426m2, the Monasterio de Santa Catalina in Arequipa, is the biggest convent city in the world and the most important religious building in Peru. Built in 1579, this convent was closed for the seclusion of about 450 nuns and was open to the “world” in 1970 after 400 years as a cloister. About 20 nuns still live in a section of the convent. Inside it, there are colonial narrow streets, gardens, cloisters and squares with the original Spanish names like Granada, Sevilla or Zocodober. Santa Catalina is located in the middle of the city and has kept the original architectural style of the 16th and 17th centuries. Beautiful by all sides, this convent maintains the same furniture and utensils used once by the first nuns. There are two site museums with original colonial paintings, sculptures and porcelain pieces. It is huge, almost a separated town inside the city, with narrow streets, plazas and fountains, a cemetery, laundry, kitchen and bakery. Arequipa’s Plaza de Armas is one of the most beautiful in Peru. On the north side of the Plaza is the impressive, twin-towered Cathedral, founded in 1612 and largely rebuilt in the 19th Century having been repeatedly damaged by earthquakes and fire. Inside is a fine Belgian organ and elaborately carved wooden pulpit. The Plaza is surrounded on its other 3 sides by colonial arcaded buildings with many cafes and restaurants. Behind the Cathedral is a pretty back street with many handicraft shops. Next to the Rio Chili is the Franciscan convent la Recoleta situated. The original building dates from 1648 and was totally reconstructed after the earthquake of 1687. Inside there is a library of more than a 20.000 books! The Franciscans are known for studying and teaching all of their life. Centuries old books are found. The oldest book dates from 1494. They housed lots of works of art from before and after the era of the conquistadors and can be visited. Indians made parts of these objects and were imported by missionaries out of the rain forest. La Recoletacan be visited daily from 9am to 1pm and from 3pm to 17pm. It contains the frozen inca mummie found on mounth Ampato by local climber Miguel Zarate and archaelogist Johan Reihard.The mummy known as” JUANITA” is fascinating as it is so well preserved The entry fee includes a 20 min video of the discovery in English followed by a guided tour in English ,French German ,Italian real recomended to visit before you go to the coca tour. *Taxi to the hotel in the centre about 4 a 5 sol. *LAUNDRY :at the reception in the hotel, or cheaper in one of the many laundry shops on the street ,after the colca canyon you come back to Arequipa to pick up your laundry.